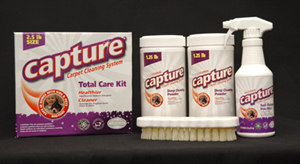 Capture Carpet Cleaning System and floor care products clean the toughest stains. 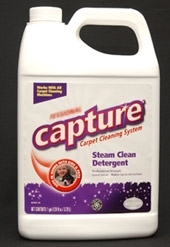 There's a Capture product for your cleaning need! Deep Cleaning Powder, and a carpet brush that can be used with any threaded handle. Both the Deep Cleaning Powder and Soil Release Pre-Mist are also available for individual purchase. The powder is sold in a 4lb handled shaker jug, 2.5lb shaker twin pack, and 8lb pail (not pictured). Cleaner extracts dirt and surface allergens without leaving moisture behind. 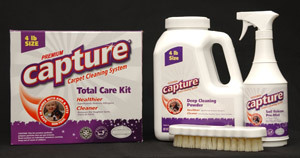 The Capture® particles act like tiny sponges that absorb dirt, spots, and spills! Kit contains: 4 lb. container of Capture, 24 ounce bottle of soil release spray, and an applicator brush. The 4 lb. kit is enough to do 3 complete rooms or approximately 400 sq. ft.
clean with Capture? Try one of our specialized products. The Pet Stain & Odor Neutralizer also comes in a convenient gallon size for large area cleaning. The perfect product for taking care of all types of organic-based pet stains. Tough grease or oil stains call for a tough cleaner. Use Capture Capture Spot Eliminator. Capture Soil Release Pre-Mist The Pre-Mist spray comes in a convenient 24oz size spray bottle.